Have you ever wondered what cinnamon rolls would taste like, sans cinnamon? Why aren't there more recipes for sticky, gooey, and sweet breakfast rolls without cinnamon or caramel? There are so many other wonderful options! I was craving a buttery, flaky breakfast bun with the sweet, tangy, taste of lemon — so I made one up. These rolls are amazing, if I do say so myself! The first time I made them they were a smash hit, and they've continued to be so every time since. 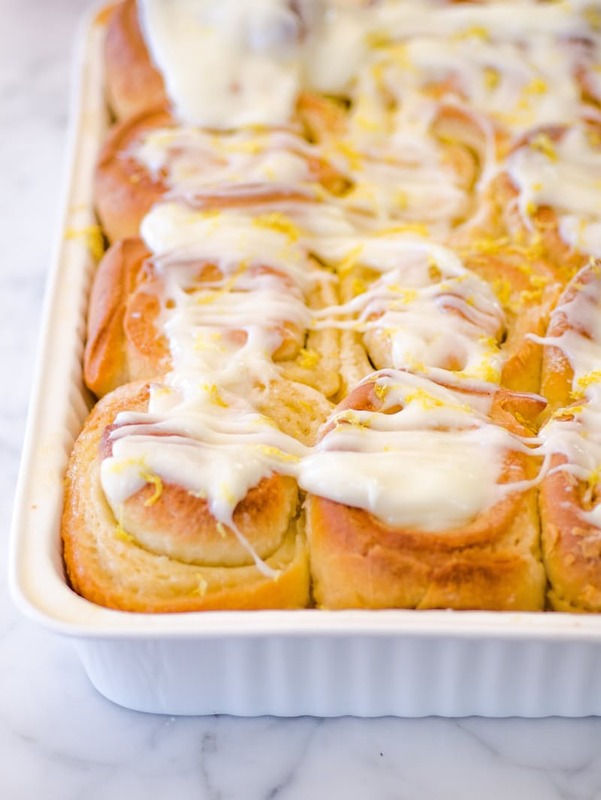 They are modeled after the classic cinnamon roll, and partially inspired by this bread, with a buttery yeast dough flecked with nutmeg and lemon. 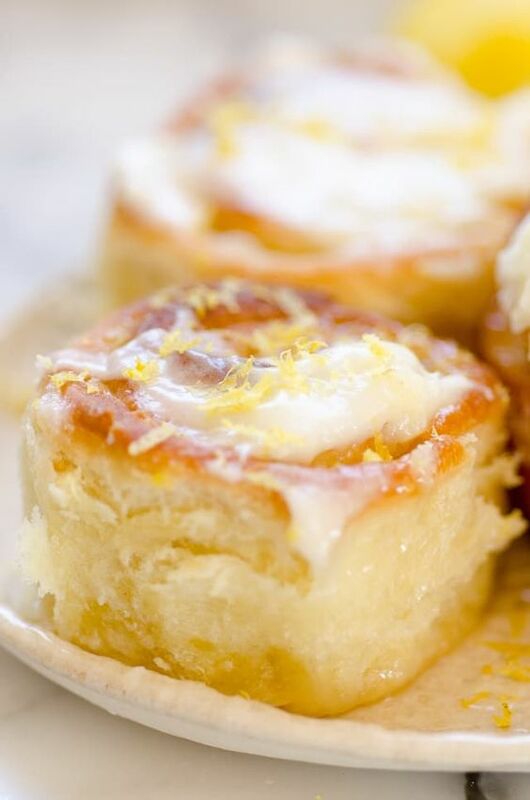 But inside each roll is a rich filling of sugar and lemon that bakes into gooey, oozy sweet-tart deliciousness. The cream cheese glaze puts it over the top, with more lemon tartness and not too much sweetness. These are my new go-to breakfast rolls. These rolls are not difficult, and like other breakfast roll recipes, they can be made at night and put in the refrigerator overnight for easy and quick baking in the morning. This is so convenient for parties and holiday brunches. The final word on them comes from my mother, who looked at me, wide-eyed, over the brunch table, and said, solemnly, "This is the best thing I ever put in my mouth." Make the dough: In the bowl of a stand mixer, sprinkle the yeast over the warmed milk and let it sit for a few minutes or until foamy. Using the mixer paddle and with the mixer on low speed, stir the softened butter, eggs, sugar, vanilla, lemon zest, and 1 cup of the flour into the milk and yeast mixture. Stir in the salt and nutmeg. Stir in enough of the remaining flour to make a soft yet sticky dough. Switch to the dough hook and knead at low speed for about 5 minutes, or until the dough is smooth, pliable, and stretchy. Lightly grease the top of the dough with vegetable oil, and turn the dough over so it is coated in oil. Cover the bowl with plastic wrap and a towel and let the dough rise for 1 hour or until doubled. → No stand mixer? If you do not have a stand mixer, mix the ingredients by hand in a large bowl, then turn the sticky dough out onto a lightly floured surface. Knead the dough by hand — see this video for explicit instructions — for 5 to 7 minutes, or until the dough is smooth, pliable, and stretchy. Put back in the bowl to rise. Make the sticky lemon filling: While the dough is rising, rub the lemon zest into the sugar with the tips of your fingers until well combined. Add the butter and beat together with a hand mixer (or in the bowl of a stand mixer) until it is thick, whipped, and creamy. Add the ginger and nutmeg. Slowly add the lemon juice and whip. It should be a thin yet still creamy mixture of butter and sugar. Refrigerate for at least 1/2 hour, or until you are ready to assemble the rolls. Assemble the rolls: Lightly grease a 13x9-inch baking dish with baking spray or butter. On a floured surface, pat the risen dough into a large yet still thick rectangle — about 10 x 15 inches. Spread the dough evenly with the sticky lemon filling. Roll the dough up tightly, starting from the top long end. Stretch and pull the dough taut as you roll, to keep the lemon filling inside. Cut the long dough roll into 12 even rolls and place each in the prepared baking dish. Cover the rolls with a towel and let them rise for 1 hour or until puffy and doubled. Bake the rolls: Heat the oven to 350°F. Place the risen rolls in the oven and bake for 35 minutes or until a thermometer inserted into a center roll reads 190°F. Make the glaze: While the rolls are baking, prepare the glaze. In a small food processor (or with a mixer, or a sturdy whisk), whip the lemon juice and cream cheese until light and fluffy. (Reserve the lemon zest.) Add the powdered sugar and blend until smooth and creamy. Glaze the rolls: When the rolls are done, smear them with the cream cheese glaze, and sprinkle the reserved lemon zest over top to garnish. Let cool for at least 10 minutes before serving, but do serve while still warm.